Despite military conscription in 1917 during World War I and in 1944 during World War II, Canada has stayed away from mandatory military service. The National Citizens Alliance (NCA) as part of its “national advancement” agenda supports incentivized military service during both peacetime and wartime. The NCA believes that the Canadian people must come first, and we reject all forms of political correctness. For our vast geographic size of 9.985 million km², Canada has a relatively small military. There are approximately of 65,000 regular forces and 25,000 reservists. In an increasingly dangerous world including more volatile weather systems, Canada needs to be better prepared to deal with potential crises and threats to our national security. In addition, a larger and better equipped Canadian military will act as a deterrence to aggressive nations and/or organizations as demonstrated by the fact the Nazi regime did not invade Switzerland because the people of Switzerland had military training, or Japan did not invade the USA because the American people were armed, or Hamas has not invaded Israel because in part Israelis are trained in self-defense. ● Create a co-op program in the military for youth from grades 9 to 12, whereby voluntarily they would have the opportunity to be trained and educated in the military during their four vacation breaks, and upon graduation from high school complete 4 months in the military. The Canadians who complete the program will be awarded 8 months service in the military, and be reimbursed 100 percent for select courses completed while in the military. Further, they would have the option to pursue a career in the military or return to private life. 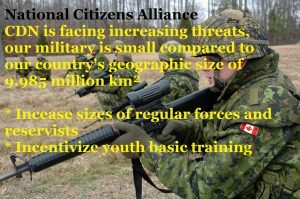 The National Citizens Alliance believes that the national interest should override individual interest when it comes to national security. The Mandatory Military Service policy statement requires a vote of the NCA membership to be adopted. A minimum 70 percent voting membership must support the policy and with a 50 percent quorum of voting membership as per the NCA Constitution (2014).